How do you tap into the awesome power of God? 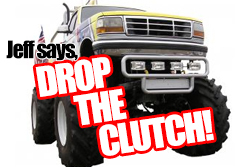 You gotta “drop the clutch”! help and all that – but it still seems weak. Dave: There is one big thing you may be missing. Dave: You took off like crazy! Dave: The engine was powerful, but until you dropped the clutch it didn’t matter. what JESUS SAYS TO DO? Dave: I’m thinking the Bible would feel a bit more … powerful!